Still need some gift inspiration for the crafter on your list? 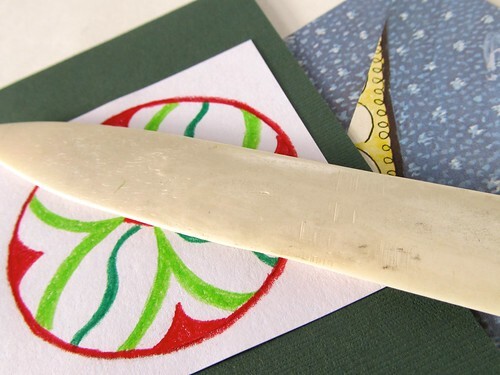 If you know someone who likes paper projects, a bone folder is a must! At least I think so! 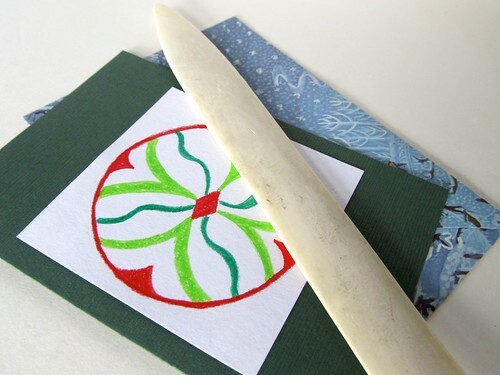 I use mine all the time to make nice crisp folds for my cards and envelopes. (It also comes in handy for fabric projects where you need to make or work something into a corner.) Does it creep me out that it is literally made of bone? Yes, maybe a little, but my love for it far surpasses the creep factor. I bought mine at a craft supply store, but I see that Amazon has a few different ones, like this one, for a great price. I also saw there are a few out there called "bone folders" that are not made of bone, but of plastic or some other material. Since I've only used one made of bone, I'd be nervous about trying a different material. Hope all of your holiday preparations are going well! I'm off to work my crafty fingers to the bone! Hi Kate, I also have a 'bone folder'! Though I'm not really sure at all that it's made of real bone! I can't believe I've missed out on so many super posts!! !